Photography Tips - Take Better Smartphone Pictures. The camera in your phone is probably brilliant and it's always with you so that means you're going to have opportunities to take some great pictures. Perhaps though when you look at your shot you feel disappointed with it and you don't know why. What this article is going to do is show you how you can easily improve the pictures you take with your smartphone. All of the images we include here were taken on a smartphone and not the latest model either. We used an iPhone 3Gs for all of these images which is very basic to say the least! (Update, for the panoramic image, we used an iPhone4s). A Further update, August 2017. It has been mentioned that we used an iPhone 3Gs for most of these pictures and whilst this is now old, very old technology, it really doesn't matter what camera we used. The techniques we describe here apply whether you're using the latest smartphone or the oldest brick. (Apart from maybe the apps you can use). Real photography always has been and always will be about the picture and not the equipment used to make it. 1. Sometimes you need to bend your knee! 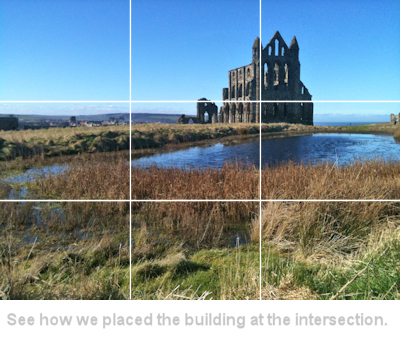 We have made this our number one pointer for a reason, most people look to take a picture right from where they stand, so they'll always have an eye-level view which actually can be a bit boring. Why not go low? Bend that knee and see how things look from closer to the ground? If you're photographing your children, going down to their level will instantly give you more impact. The same could be said of a nature shot or a street scene, go low, or go high. Always consider alternative angles. In the example to the right, we put our smartphone right in the weeds to shoot from actual ground-level. I love this picture. There's so much impact from that low-level angle and to see the dandelion towering up looking like it's in the midst of a forest when most of the time they are barely noticed as you walk past them. Smartphones are so small and light they can be positioned in really interesting places so be creative with those angles and experiment. The beauty of smartphones is that they can maintain focus when it is very close to a subject so you can fill the frame and get right up to interesting things. So instead of seeing something you want to photograph and taking the picture from that very spot, why not take a few seconds to see if you can get a little closer to add some impact? 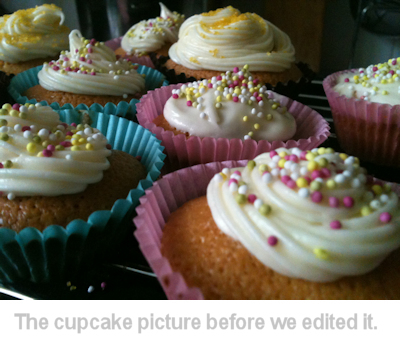 Take a look at our picture of fairy cakes. We put the phone as close as we could to the top of the cakes so they look really big! When you take a picture with your phone it's always tempting to hold it in front of you at arm's length and take the picture. This stance is really asking for trouble, the phone is light and will move around and at times will do so enough to ruin the picture. To stop the phone moving look to get some support to hold it and you steady. You can lean against a tree, wall, anything to brace you. How about putting the phone on to a fence or wall to give you some rock-solid support? 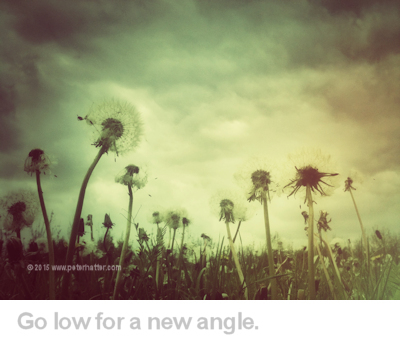 If you're getting low, you could even rest it on your knee as you bend down. How about bending your arms and bracing them against your chest to give yourself a stable base to hold the phone still. When you're out with your phone it's unlikely you're carrying a tripod so try and find the next best thing. If stability is crucial then there are lots of mounting options available. From the traditional tripod, through to mounts like the Gorillapod which is a very flexible tripod. However not only does this stand on flat surfaces, it's legs are so flexible they can be wrapped around things which offers numerous opportunities to put that smartphone camera in all sorts of unusual positions. If there's a bigger budget, how about a hand-held auto-levelling gimbal? These let the photographer carry the smartphone mounted on the gimbal which then levels the phone no matter what angle the gimbal is held. These are perhaps of more use to anyone using the phone for recording video. 4. The Rule of thirds This is a great way to improve the composition of your pictures and you can use it with any camera you use, not just your smartphone. It's an idea that's been around for many years, going back to when painting was the only way of capturing a scene. The idea is you use imaginary lines to divide your scene in to thirds and place the point of interest at one of the interesections of the lines. This improves the look of the scene and generally looks more interesting than if you placed the focus of your picture right in the middle. See our example to the right where we have added those imaginary lines. It's not just the point of interest that you can place on that intersection, you can use one of the horizontal lines to place the horizon. To get the best from this idea you should have a go and get a feel for how you see the scene and how your pictures work out when you use it. Try each line to see how this changes the feel of the picture. Give it a go, experiment and practice. 5. Have some foreground interest. There's no denying that taking a picture of a beautiful landscape is always tempting but somehow these pictures tend to give us our biggest disappointments. The picture never looks as good as the real thing. You can use the rule of thirds to help you out here and there's one more thing to help you too, add some foreground interest. By doing this you are giving your picture some depth. 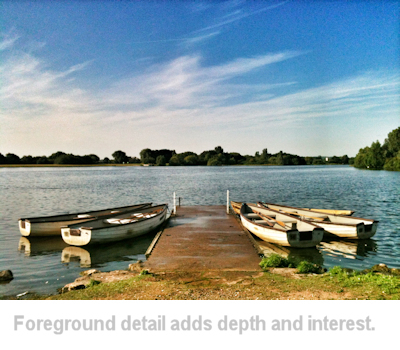 Take a look at the boats in our example and imaging the scene without them. That would be a lot of water! The boats let you see the scene from the front and move out around the picture as you look at it. Without them your eye can only see the lake. Of course as with all rules you shouldn't use them every time as there wil be occasions when it's totally not the best way to capture the scene but you should always have them on your mind as an option even if you decide not to use them. What that means is try not to let too much light in or indeed avoid not letting in enough. If you let too much light in then you lose detail in bright areas like the sky. Take a look at the dandelion picture, the detail in the sky adds so much to this picture but if I had let too much light in then all of that lovely detail would have been lost. Certainly on my phone I can't control the exposure very well so I try to find an angle that means I catch just the right amount of light and maintain the composition I want. The same rule applies to dark areas too. If there's not enough light then darker areas like shadow will have no detail either. The little control I do have over the exposure on my iPhone at least, is to touch the area on the screen where exposure is important. So using the dandelion image as an example, I wouldn't want to over-expose the sky so I touch the screen in the sky area and the camera adjusts the exposure for that part of the picture. This means detail is retained in the cloud. However, darker areas will then become very dark. Also, when I touch the screen the camera will focus on that part of the image too as it thinks it's the most important as I've pointed at it. This is fine but, in our example, I also wanted the dandelions to be sharply in focus. What I did in the end was to find a part of the picture that should be in focus but also allows me to expose for the sky, so I selected an area at the top of the dandelion which sees the dandelion as the focus selection but also has a lot of sky coming through so gives me a decent exposure. Experimenting with this is useful, maybe taking a couple of shots with different exposures to ensure you come back with something workable. 7. Get an editing app. Pressing the shutter to take the picture is just the beginning. If you get yourself an editing app you can do so much more to your pictures to get the best out of them. The editing apps are packed with tools that allow you to firstly make basic changes to the picture such as brightness, contrast, shadow-fill, sharpening and white-balance which even if you left it at that will mean the image will be more appealing. However many of these apps have lots of bells and whistles to enhance the photo in all sorts of creative ways. There are many editing tools available but our favourite is Snapseed from Google. We especially love the retrolux filters to really enhance the picture. We used that look on the dandelions shot. We used the tilt-shift filter on the cupcakes picture. As with most things you should practice with it until you become efficient with all of the features. You don't have to use every effect every time because some just won't suit the subject. Experiment with the filters, try them out and undo them if you don't like the look. As you get in to the swing of using these tools you'll develop a little work-flow and if it's anything like mine you'll make basic changes to the picture first to give you a sound base to work on, (sometimes you don't need to do anything else) then you can get real creative and try those brilliant filters. 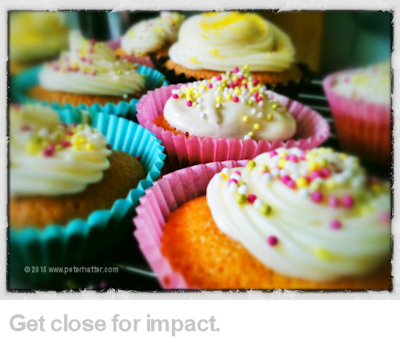 We have included the cupcakes picture before we worked on it to show you the effects of brightening it up, making the colours pop, adding a frame and that tilt-shift effect. As fun as a camera is in a phone, there's a bit of a restriction as to what you can do with that small lens inside a body that's actually supposed to take phone calls. So if you want to part with some cash, you can buy accessories designed to work perfectly with your phone. How about taking your phone under water? There are housings designed to take a phone and protect it in that usually terminal environment, giving you whole new Worlds to explore, surfing, scuba, or just your local duck pond. Put that camera in places it was never meant to go. Clip-on lenses let you get real close by providing a macro option to magnify your subject. There's another sphere of imagery previously unavailable to you with a standard phone. 9.Check out your phone's features. Click on your phone's camera app and you're likely to be good to go with the basic settings to get a decent picture. This could be enough for your photography needs but it could be worth exploring what other features your camera can offer. Taking my iphone as an example, it offers square format (1:1 side ratio), standard photograph format, i.e. 4:3 edge ratio and panoramic, where I can make the picture as wide as I like. Subjects will suit different formats so think about how you can frame a scene in the different size ratios. 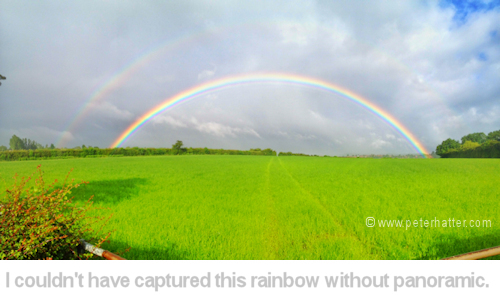 You can see all of the images in the article are 4:3 size ratio but I've included a panoramic landscape image of a rainbow to show you what's possible. I couldn't have captured this end-to-end without the ability to pan along it using the panoramic feature. The other formats were just too small. As phones become ever-more advanced, new camera features are added which offer new and interesting ways to capture an image. One new feature (to me anyway) I liked was on a Samsung phone that creates a large image by photographing bits of the scene. The in-camera software joins the parts together to make one large image. Then the viewer can zoom in to parts of the picture to see it in fine detail. There are apps that increase the camera's functionality too. The Photo Sphere app lets the photographer take 360-degree images of a scene which can then be viewed on a computer giving that 'emmersive' effect as the viewer scans around the entire location of where the photographer stood with the phone. Other apps let the photographer have more control over the settings of the camera so taking a picture doesn't have to be so automated which is great for creative control. This Gizmodo guide goes into the detail of a few camera apps here. Getting to know your phone's camera settings or increasing it's capability means you're in better shape to capture the perfect image. Once your picture quality starts to improve, why not think about making some money from your new found skills? There are specialist stock libraries that licence the use of smartphone images and they're always on the lookout for new contributors to submit to their collections. This is taking you into the realm of stock photography and should you start to sell your pictures, you'll probably find this quite exciting and want to improve further! We still find it a great thrill to see our stock images licenced. By sell, we mean licence. You never 'sell' your pictures. They are always yours, you sell the right to use the image by means of a licence. See below for more information about stock photography and also our interview with Ryan Cardone who shoots surfing pictures with his smartphone. Update History: 8th August 2017.